Dr. Jumana Odeh is a highly-regarded pediatrician and public health expert in the Middle East. She is the Founder and Director of the Palestinian Happy Child Center (PHCC), a non-governmental organization in Ramallah that promotes the well-being of children with special needs since 1994. The centre promotes early screenings, diagnoses, specialized care, therapy and support for parents and caregivers, who often struggle with how to care for their handicapped children. The centre also provides information for the public in a region that does not always recognize disabilities. 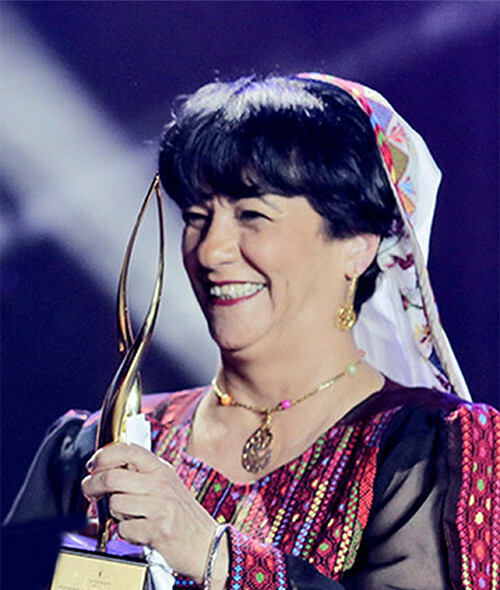 Furthermore, Dr. Odeh has built an impressive career in Palestine and beyond, throughout which she has demonstrated an innovative and strategic vision to aid the most vulnerable of society. Commencing her medical service to the Palestinian people in 1981, Dr. Odeh opted to work for government hospitals in lieu of more profitable private practices. Her career has since included work as a pediatrician at Augusta Victoria Hospital in Jerusalem, as a faculty member of Al Quds University and a faculty director at Harvard, and positions with Union of Palestinian Medical Relief Committees, Caritas Baby Hospital in Bethlehem, UNICEF, the Palestinian Ministry of Health, Save the Children in Gaza, the Swiss Development Cooperation, the Canadian International Development Research Center, and the International Federation of Health and Human Rights Organizations. She also regularly participates as an expert at international workshops and conferences and writes for the International Herald Tribune. She has appeared as a health expert on Palestinian TV, Al-Jazeera, Abu Dhabi TV, CNN, Democracy Now, BBC and Night Line. Dr. Odeh is the winner of the 2008 Health Award from World of Children Award and the first Arab professional to win the AidEx 2013 Humanitarian Hero Award.